What Types of Closet Shelving Are Available? No closet or storage space would be complete without shelves and hangers. 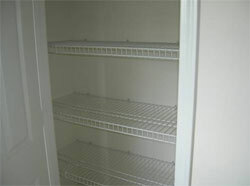 Some easy to clean and install wire hangers and shelves were installed in all of the closets and the pantry. Wire shelves tend to be fairly inexpensive to install, add on to and there are a host of options to increase their usefulness. Solid wooden shelves and built in� closet organizers are an even more sturdy and even luxurious item to add to your home and can make for great resell value. If you are the Do-it-Yourself� type, these built-ins can be added later at a fraction of the cost. Everyone would love to have an organized closet space to easily pick out clothes for every day and every occasion. Accordingly, you have to familiarize yourself with the types of closet shelving available for you to choose from for your new home. Knowing this will help you plan in terms of how you will organize your clothes once your home construction is complete. Closet shelving is classifiable in two ways: by how it is installed and by what materials it consists of. If you are the type that likes rearranging your closet every now and then, you will like freestanding shelving, which is a very flexible system of shelving. This system consists of removable closet shelves where you can place folded clothes among other things. When using this system, you can modify how much space a shelf takes by adjusting where it is placed. If you do not bother having closet shelves that are not flexible, you will be just fine with permanently installed shelving. This system's shelves are usually fixed though some may be adjusted. Regular closets often have permanently installed shelves. However, if you get a closet from a store or have a walk-in closet built in your home, you can have shelves permanently installed in your closet. Dormitory closets and closets in small apartment spaces typically consist of hanging closet shelving to maximize space. Hanging closet shelving systems are usually made of canvas and can be collapsed when not in use. They have handles, which are wrapped around closet rods. If you are looking for cheap yet sturdy and flexible shelving, getting wire shelving might be good for you. It is made of small separate wires you can attach to each other, you have the freedom to design how your wire shelving will look like. You can also opt to buy pre-made sets like wire bins to make your job easier. You can install a wire shelving system into your closet on your own with the help of a few simple tools like a tape measure, screws, nails and a hammer. Make sure to have the support tracks installed well enough for the shelves to sturdily hold the weight of the clothes you put on them. If you don't like how wires look and want a wooden shelving system that's shiny and easy to clean, laminate shelving is the system to use for your closet. You can have either a permanently installed laminate shelving system or a system that's free-standing. The smoothness of this system's shelves makes it easy for you to wipe dust and other dirt particles off of them. Makers of laminate systems even provide drawers and other closet additions that make your closet as customizable as possible. Many homeowners still prefer getting their shelving systems custom-built so they'd fit well with the style of their houses. The problem with custom-built shelving, though, is that it can be time-consuming to make or very expensive to have it made. If you're serious about getting a shelving system with a design that's not available in the market, get custom-built shelving. This way, your imagination and financial resources will be your only limits when thinking of how your shelving system will look and function. For practical homeowners, metal and plastic shelving systems are available almost everywhere. You can pick a system with as little as two shelves and as many as possible, because the shelves of metal and plastic shelving systems may be removed or added. The shelves and rods of these systems are very easy to assemble. You can also choose from among many different sizes. Visit your local hardware or building supply store to research your options. Many stores have different systems set up on display. If you are able to do this, you may be able to find a closet system that you like and that will best suit your needs.